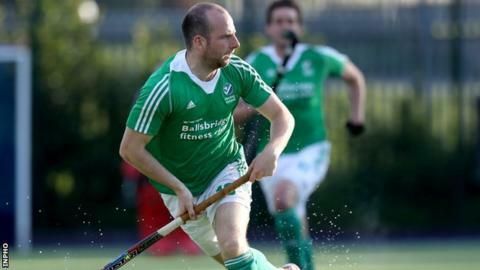 Annadale recorded their first Irish Hockey League win of the season with a 4-1 away victory over Cookstown. The defeat by their Ulster rivals leaves the Co. Tyrone side without a point after four games. Lisnagarvey kept up their 100% start with a 2-1 victory at last year's champions Three Rock Rovers to pull within a point of leaders Glenanne. Banbridge lost for the first time in the league this season, going down 3-1 at Monkstown. When the season finishes next April this win for Annadale in the Ulster derby at Cookstown may be difference between relegation and staying in the IHL. On a heavy pitch at Steelweld Park a Rhiley Carr drag flick from a penalty corner gave Annadale the first quarter lead. David Tremlett's neat finish just after half-time put them in control but Cookstown responded well and their pressure was rewarded when Stuart Smyth scored to leave the game finely balanced heading into the final quarter. However, after only 30 seconds player/coach Peter Caruth intercepted a loose pass in the home team's defence and although the Irish international didn't get the contact he wanted on the shot, it was enough to regain a two-goal advantage. Carr's second impressive flick from a corner added a little gloss to the scoreline. It took only 35 seconds for the Ulster side to take the lead at Three Rock Rovers when Daniel Buser started and finished the opening attack of the game. Peter Blakeney pulled the champions level from a penalty corner but the game winning goal was scored by Daniel Nelson as Garvey made it three wins out of three. Banbridge were beaten at Monkstown despite taking the lead through Zach McClelland. The Dublin side were soon on level terms thanks to Guy Sarratt and after a scramble in the circle Karl Smyth put Monkstown ahead. After Bann had pulled their goalkeeper late in the game David Carson ran the ball into the empty net to round off the scoring.